Rượu cần (Can wine) is typically drunk for special celebrations or ceremonies such as weddings, festivals, or harvest feasts. It is often drunk by in a nhà rông, a fire, or community house. 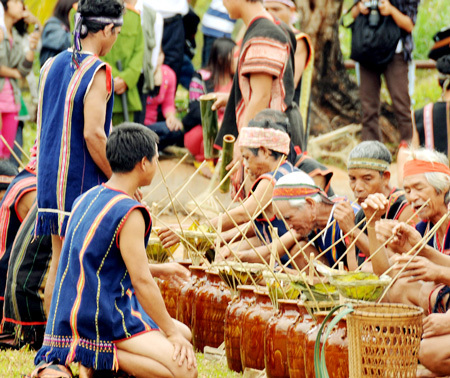 People often dance and play music (in Tay Nguyen region) after drinking. Can Wine (also called tube wine) is a fermented rice wine produced in Vietnam, in particular in mountainous areas like Tay Nguyen area. How to make the wine? It is made of cooked glutinous rice (nếp) mixed with some kinds of herbs in the local forests. The types and amount of herbs added differs according to ethnic group and area. This mixture is then put into a large earthenware jug, and allowed to ferment for at least one month. Can wine's strength is typically 15 to 25 percent alcohol by volume. Simple available local materials are altogether fermented by wild herb in a pottery jar for day. Its taste is total different from rice alcohol or any kind of wine - so bitter or strong that may lead you dizziness. Its sweet taste would make you drunk without any predictable consciousness. When ís the wine served? Can Wine (rượu cần) is typically drunk for special celebrations or ceremonies such as weddings, festivals, or harvest feasts. It is often drunk by in a nhà rông, a fire, or community house. People oftens dance and play music (in Tay Nguyen) after drinking. When you are invited to drink rượu cần by the locals, it means that you are seen as distinguished guest.